James McCullough proudly holding his ‘Child Superstar’ award which he received at the Families First Awards. 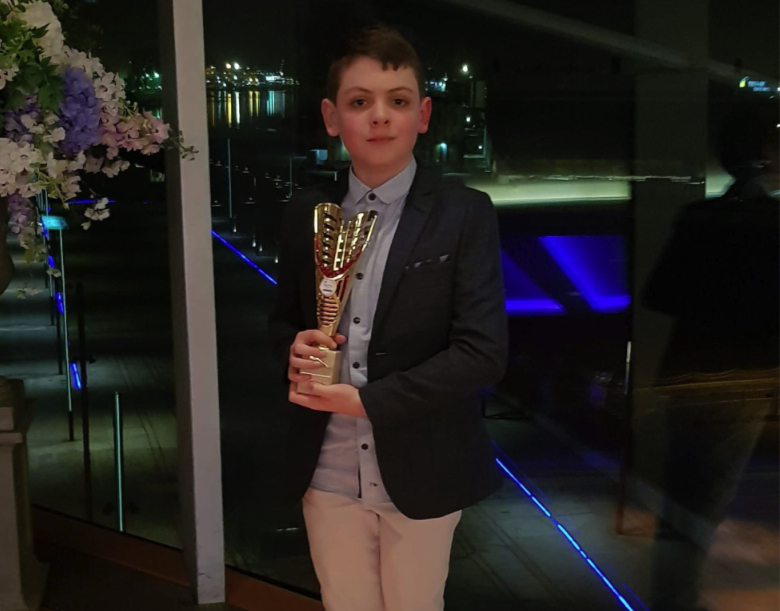 OMAGH boy James McCullough was recognised as a ‘Child Superstar’ at the Families First Awards at the weekend – for his on-going dedication to raising much needed funds and awareness for the medical condition, Myalgic Encephalomyelitis (ME). ME is a long-term chronic, fluctuating, neurological condition which affects the nervous and immune systems. James’ mother Aileen is severely affected by the condition and has always been the inspiration behind his awareness mission. When James was just eight years old he raised £1,000 for the charity ‘Hope 4 ME and Fibro NI’ which fundraises for bio-medical research about ME and fibromyalgia, as well as raising awareness of the conditions. Now 12 years-old, James is the youngest ambassador for the charity and his contribution has already made a positive impact to thousands of patients. Having previously been awarded the ‘Fundraiser of the Year’ award and recognised by the volunteer bureau for his hard-work, James is determined to raise more money for the charity which is so close to his heart and has set himself an even greater challenge. Setting up a new campaign ‘Help Me to help ME’, the Drumragh Integrated College student hopes to raise £2,000 for Hope 4 ME and Fibro NI. The young Omagh student’s inspiring work has not gone unnoticed, and James was deservedly presented with the ‘Child Superstar’ award – sponsored by Petite Feet Day Nursery – at the glamorous, black tie Families First awards ceremony at the Titanic Quarter Belfast last Saturday. When asked what James’ hard work has done for the charity, founder Joan McParland replied, “What has it not done!